As we walking along the way to the entrance, we saw many shops and restaurant (KFC, Subway Burger King and etc) and some souvenir shops around there. We show them the tickets, and they just tear off one part of the ticket. No checking on our bags and the staff is very friendly and helpful. We went during weekdays so not really crowded and mostly are tourist. The Legoland is not really that huge that I expected but we have enough time to cover all the activities and places to visit. We did not actually study the map and just go along the way. The disturbing part is the weather. When we reached there, the rain stops, but still drizzling. Then as we walk inside, the rain stops again and we quickly walk around and start to take pictures. Then, we move on to the Land of Adventure. There are 4 Activities inside this park, Lost Kingdom, Beetle Bounce, Pharaoh's Revenge & Dino Island. I accompanies my girl playing this mini Bettle Bounce. I am so proud of my girl. She has grown up to be independent and wanted to play this herself. She enjoy it as much as I do..but I am little bit shaky..haha It's been a while I did not step into those theme parks. Then, I worry my girl if she is hungry after the long hours in the car, we stop by Burger Junction, just nearby to have our hotdogs and drinks. All food and drinks are in set menu and price is super expensive from RM 22. It was really costly! It was extremely hot after the rain stops. I was glad that at least the sun comes out and we can move on to the next stations. We pass by this Miniland, All creation of lego to make this wonderful Miniland. There are famous scenes from 17 Asian countries, including the Petronas Twin Towers, the Merlion Statue, Airport, KL Tower, the Taj Mahal and etc.The whole of MINILAND is so amazing and some can move around. It took three years and more than 30 million LEGO® bricks to recreate some of Asia’s best known landmarks. Impressive place to admire how they make this Miniland. The cloudy sky hunting us and now we need to find some place to hide.. We quickly move to another section called Imagination with 6 activities in imagination park, Build & Test, Duplo Express, Dupro Playtown, Lego Studios-4D cinema, Observation Tower & Kids Power Tower. My girl is excited when she saw the huge playground while myself and hubby looking around for some cool activities. The weather is unpredictable and I am praying so hard..Please don't rain..I beg you.. The observation tower is heading 50 metres up and we are relaxing sitting there observing the fantastic view over the whole of LEGOLAND Malaysia. Air conditioning inside with ample of seats and exactly turning around one circle to see the whole place. Next, we move to Lego Kingdoms with 6 activities to venture inside - The Forestmen's Hideout, Castle Stage, Dragon Apprentice, Royal Joust, Merlin's challenge & The dragon.. More to sight seeing for us as the roller coaster game is abit NO NO for all of us. Can't get enough of the Miniland..there are so much to capture.. and now the weather is not so hot..
Also managed to catch the long train sitting inside seeing the scenery comfortably. We stop few places to rest and the toilets are clean, with some places that are air conditioning such as the lego bricks where the kids can go inside and stack the lego. It's time for 4D movie show.. We need to queue early according to the time given. Crowded and they have certain show time. Ample of seats in the theater. I can feel the breeze, cooling air, with the bee coming out from the screen and my girl scream!..After 10-15 minutes of the show, suddenly the screen did not move at all and there are few bubbles coming out from the front and people at the front side is the most affected side..The white bubbles are keep blowing on their face non stop and also up to our place ( Lucky we are seated at the corner end near to the exit door at the upper side). The whole place is so cold and we are all felt irritated with the whole mess. After a while trapping inside the theater, only the staff announce that they have technical problem and they finally open the exit door for us..Such a scary experience and the most lousy theater I have been so far. They should defect the problem earlier and make announcement and solutions for us quickly. We all are stranded inside. Horrible! After that, we back to the first station that we actually missed out. The Lego City. The rescue academy was quite fun. Three of us in a team and need to compete with each other driving out the fire engine car and stop by here the area to save the fire. And again turn back and drive back the car to the starting point. Lego City concists of 7 Activities in this area - Rescue Academy, Lego City Stage, Legoland Express, The Shipyard, Lego City Airport, Boating School & Junior Driving School. My girl is scare .She tried the driving school but she is not confident enough.She enjoyed the most - Aeroplane ride..Driving up and down controlling herself. We have few rides again and again. Not to forget another section called Lego Technic, 5 section - Lego Academic, Aquazone Waze Racers, Lego Mindstorms, Project X and Technic Twister. It seems like not suitable for my little girl age and we just pass by taking some pictures. We also saw this Starwars Lego section is under renovation and will open in Sept 2014. Almost 3pm and we ask the staff to let us go outside for foods and come back again. He said only allow go out one time and they will put a cop on your hand. We went out the shops and have KFC to fill up our hungry stomach. The price is more expensive than the usual price. After all better than having inside Legoland which are more pricey. Now we are ready to go into the Waterpark. Pack our clothes and take a picture at the entrance. Saw the Legoland Hotel..Looks nice, perhaps we shall stay here next visit. LEGO-themed Water Park offers 13 water attractions with water-based slides, both for adults and kids slides are available, Lego Slide Racers, Splash Out and Splash ‘N’ Swirl; the kids would be entertained by this creative and colourful waterpark. First of all, we need to change our clothing's. The changing rooms is big enough but was slippery. The Locker rates are RM20 for a small one and RM40 for a large one. Expensive and this rental is for an entire day and is valid for multiple access. The lockers are accessed electronically by pressing your own code. But we did not rent any locker, Just bring our bag inside. Anyway it's my girl that I want to bring her to explore the waterpark..I can just carry the bag and observe her. My hubby had a great time bringing her around the waterpark. She is brave enough to try few water activities. Build-A-Raft River - This river is very long and the water flow is quite fast. My hubby grab the bigger float and carry my girl along. Enjoying collecting the lego. But disappointing with the quality of the float as mention in the website that we can actually stack the lego onto the float. The float itself does not have the lego base and all are spoil. This section is suitable for kids age 5 years and below. Large pool with shallow water which is design just nice for toddlers. There are 3 short slides here with one huge slides that my girl love it so much. This beautiful setup called Joker Soaker build with different levels, variety of slides, and water cannons. There are very huge 2-metre LEGO Joker dumps 350 gallons water dropping off on your head anytime. My girl likes to climb to see the water flowing. Positive side: My girl first visit to Legoland theme park, The Friendly and Smiley Staff. 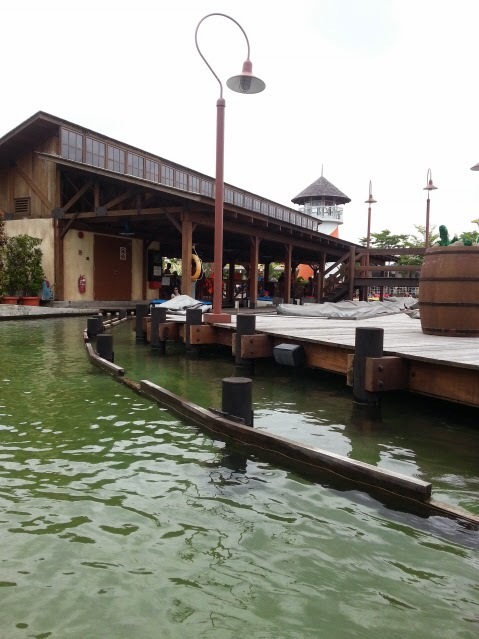 The people working at Legoland Malaysia Water Park are friendly and helpful. Smiling all the way and when seeing you they will smile and said "HI. ", more rides for kids and Legoland is the ideal place for family and kids. Challenge : The Parking direction, The weather (cloudy, rainy and sunny), Lack of Rest Areas, Lack of Shades, No clear signage, Always asking us to take pictures which we are not obliged to, Some section are not well maintain especially the technical issue inside the theater, Too pricey on the food and drinks, Slippery floor in the locker room and changing area.